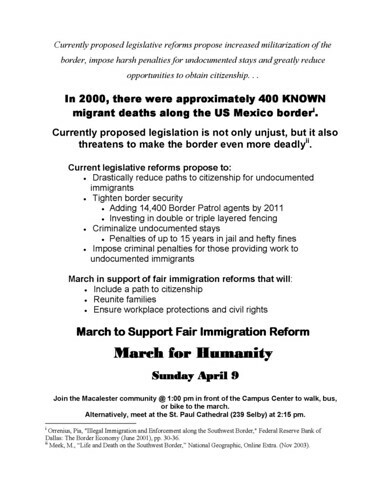 Ana put footnotes in Mac’s April 10 Immigrant Rights March flyer. omg. “[Seniors] have enrolled” is not the exact phrasing I would use. “[Seniors] have been enrolled” is more accurate. Let’s take a quick look at the numbers. Leavitt includes all kinds of non-voluntary enrollment, and even non-enrollment information into his 27 million figure. First, 30 million is 69% of total Medicare beneficiaries, not 90%. Second, 10 million seniors/disabled out of these 30 million have not enrolled to Part D at all. They have had drug coverage all along (Already w/Creditable Coverage), and they should not be included in a report that measures CMS’s success in implementing Medicare Part D. They are beneficiaries to the Employer Retiree Drug Subsidy (RDS) and Federal FEHB and TRICARE programs. Medicare-Medical Dual Eligibles: these are low-income seniors/disabled who were forcibly enrolled to Part D in January 1 2006, and went through all sorts of hardships while coping with the insurance companies’ neglect towards them. MediCaid sent them a NOA in late 2005 telling them that their MediCaid prescription drug benefits were being terminated, and Medicare just enrolled them to a randomly selected plan in December 31, 2005. Yes. RANDOM. Formulary and Pharmacy Network hell ensued. Medicare Advantage (HMO, Part C): they were also forcibly enrolled to an HMO-subsidiary PDP from their own HMO by January 1, 2006. They can’t opt out for another plan, because then they lose their entire HMO benefit. They never filled a form requesting Medicare Part D. How can you call that “the senior enrolled”? And out of those, only 8 million have enrolled to this date. That’s why CBOs and CMS are scrambling to get the remaining 13 million enrolled before the May 15 2006 deadline. Let’s stand corrected. The real enrollment of seniors/disabled who chose to enroll to Medicare Part D because they looked at their options and made a rational choice (a capitalist economy ideal, no?) is 8 million out of 21 million, which is a whoopping 38%. Not 90%.